We all have our favorites when it comes to picture books, and for me, one of my top ten picture books of all time is Leaves by David Ezra Stein. It is such perfect book – one very young bear experiences his first fall and winter, as leaves change color and fall on the ground. It’s a story of innocence and discovery, told endearingly with spare text and loose, expressive art. Now, Bear is back for a new adventure in Honey, our Picture Book Highlights selection for this month, a series where we put the spotlight on a brand new book that has been ordered for all agencies. Bear has woken up from hibernation, and he’s hungry. He remembers honey and rushes to the tree to look for it, but it is not to be found, not yet. Bear tries to distract himself, but everything reminds him of honey! How can Bear wait for it patiently? It’s wonderful to see Bear again, in all his innocence and delight. As with the previous book, Leaves, words and art combine seamlessly, and it’s good to be back in Bear’s island, seeing the world through his eyes. Are you curious about bees and honey? 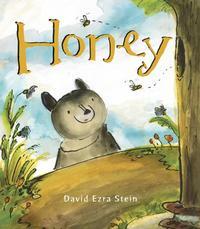 Find more books about this sweet treat and the amazing bees that make it!